Visual artist Elaine Whittaker considers biology as contemporary art practice. Her artworks are an intersection of art, science, medicine and ecology, exploring the forces that make us human, from the foundational processes and materials needed to form an organism, to the microscopic world of cellular ecologies. 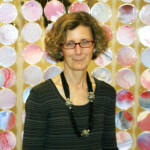 Her practice is principally based in installation, and includes sculpture, painting, drawing, digital imagery and sound. Recent works have centred on the aesthetics of disaster, the fear of pandemics, and on the body as a site of infection reflecting narratives and elements of anxiety that are found in popular culture, scientific research, and personal experience. Are we our diseases? Is the world just one big petri dish incubating the source of its ultimate destruction? 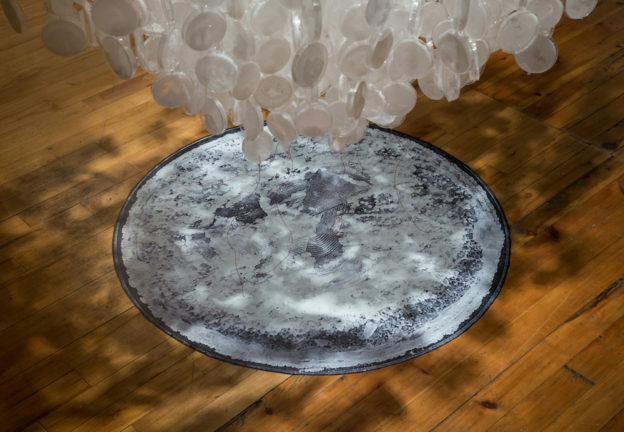 Shiver is an installation of mixed media artworks that turns fear, fear of the viral, of the microbial, and of impending pandemics, into beauty. Ultimately Shiver asks viewers to consider that fear and beauty reside in an uncomfortable dialectic, in this precarious time of contagions, epidemics and bioterrors. 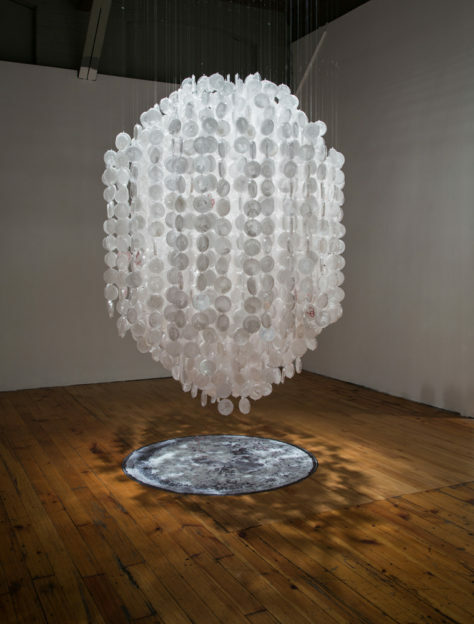 An ‘organism/virus’, hangs from the ceiling, glimmering with salt crystals and red mutations. It is composed of over 2300 petri dishes and pipette tips, capturing prisms of light through grown crystals of salt. It appears to be erupting but is loosely tentacled to an oversized floor-bound photo representation of a salt crystallized petri dish. As viewers walk around the piece, it shimmers like a chandelier, and their movement gently brings it to life, evoking a shiver. 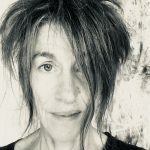 (Ruth Roach Pierson is a Canadian poet and her published works include Where No Window Was (2002), Aide-Mémoire (2008), Contrary (2011), Aperture (2014), Realignment (2015), and an edited anthology of film poems I Found It at the Movies (2014). What happens when we make beauty out of what we fear? Art. In this case Bioart or art that refers to the viral and microbial, the pathological advance of pathogens, a reality of our times. 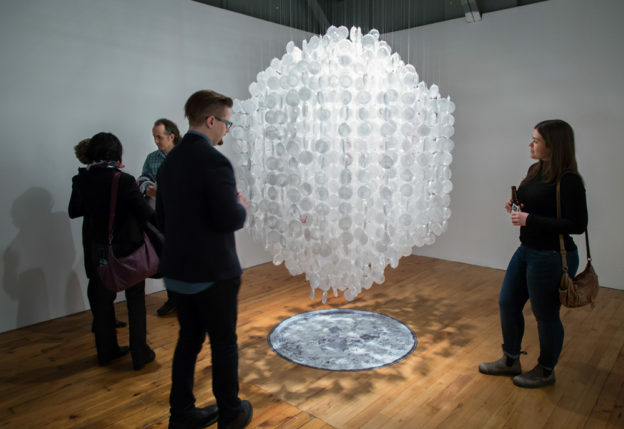 The central piece of Elaine Whittaker’s installation is a cylindrical accrual of petri-dishes vertically strung. Each petri dish contains a desiccation or distillation of evaporated brine. Some house an encrusted twist of red wool—Whittaker’s visual equivalent for mutation. Shiver. The overall structure is loosely crystalline, the long strands of petri dishes seem to have grown from the core, mutating in pleasing shapes. Under a microscope the tiny things that kill us are, nevertheless, beautiful. The sodium chloride crystals at the heart of Whittaker’s Shiver form patterns in dozens of individual petri dishes inoculated with a concentrated salt solution and left to dry. 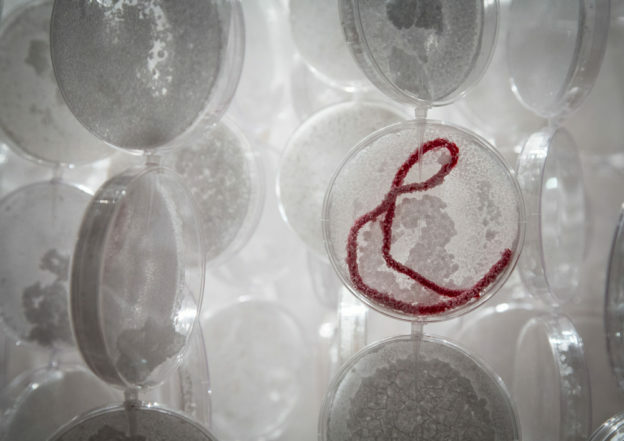 Each petri dish represents a human cell, and interwoven into random cells is a bunched red thread, or “mutation.” In the Ebola Graph series, Whittaker’s crystals cluster on thin wire threads, forming a crystalline grid on which is represented the tragic burden of cases and deaths in the ongoing Ebola outbreak in Guinea, Liberia and Sierra Leone. 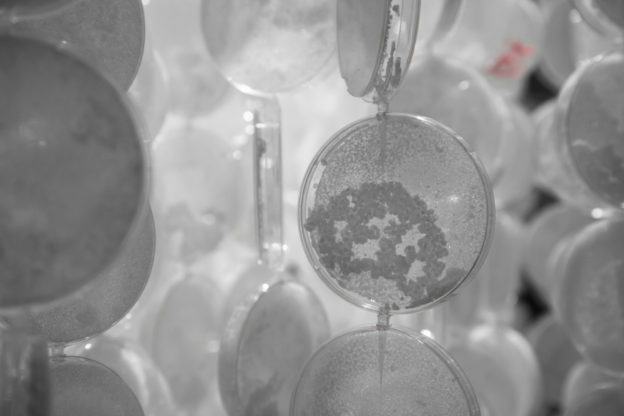 Just as Whittaker’s progress was disrupted in the making of Shiver – she lost a quarter of her petri dishes after a test installation and had to begin again – the exhibition hints at the disruption which can occur at the intersection of health and the human environment. On the surgical masks of the Screened For series the faces of twelve separate pathogens are delicately rendered in gouache, juxtaposed over the mouths of potential human hosts. While in reality infectious agents invade the body through several channels, such as a mosquito vector or a bodily fluid, and while there often exist robust public health measures to prevent or intervene in their transmission, the perception of their threat is palpable in this work. Who is the protagonist? Has she been exposed? Is her mask protective, and what constitutes true protection? Each work reflects the duality of everyday life. The artist’s salt “mutations” portend disease, and yet salt as a substance has many curative and life-giving properties; aren’t salt solutions used to irrigate wounds and restore fluid balance? The exhibit Shiver can be interpreted as ominous in nature, and yet, is not the act of shivering the body’s own attempt at homeostasis? Photo credit: all photos by David Williams except Screened For self portraits by Elaine Whittaker.